Untamed begins with Ms. Goodall’s childhood, growing up outside of London and with a single parent: her devoted mother. 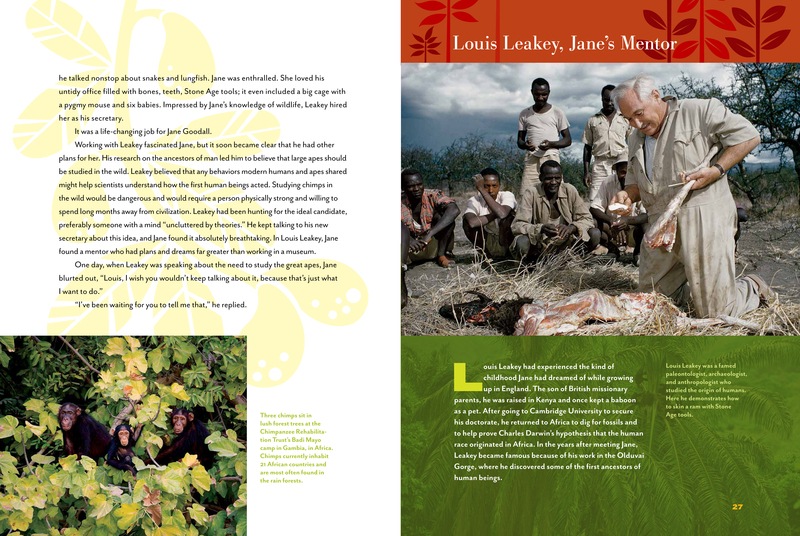 It then explores her first efforts at making a living and then how she needed up in Africa and working for Louis Leaky. Then the most interesting sections of Untamed unfold with Jane Goodall in Africa, looking for the elusive chimpanzees with her mother. Kids will get a look at Ms. Goodall’s “family album” of chimpanzees she researched and fondly loved. Finally, the author put together a timeline of Ms. Goodall’s life thus far. At age 81, Jane Goodall is not slowing down; nor does she look her age. Untamed is one of the most sophisticated National Geographic Kids books. 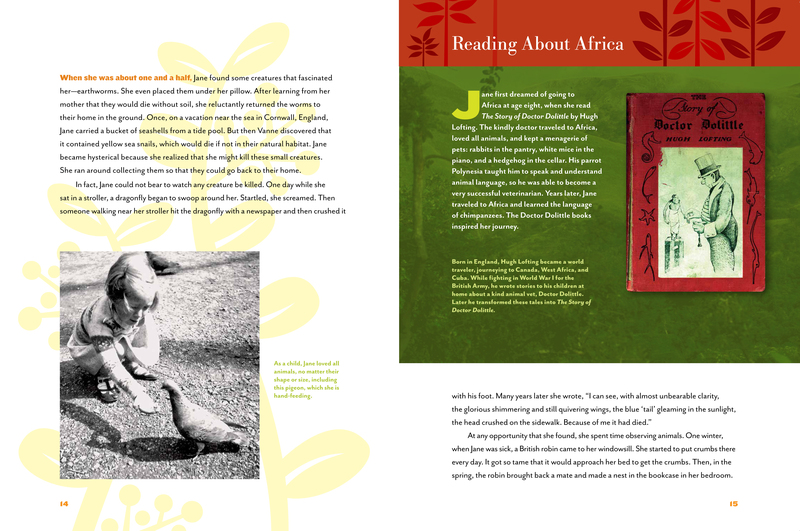 It is well thought out in both the text and design, is visually beautiful with luscious photographs and graphics, and accessible to both children and adults. 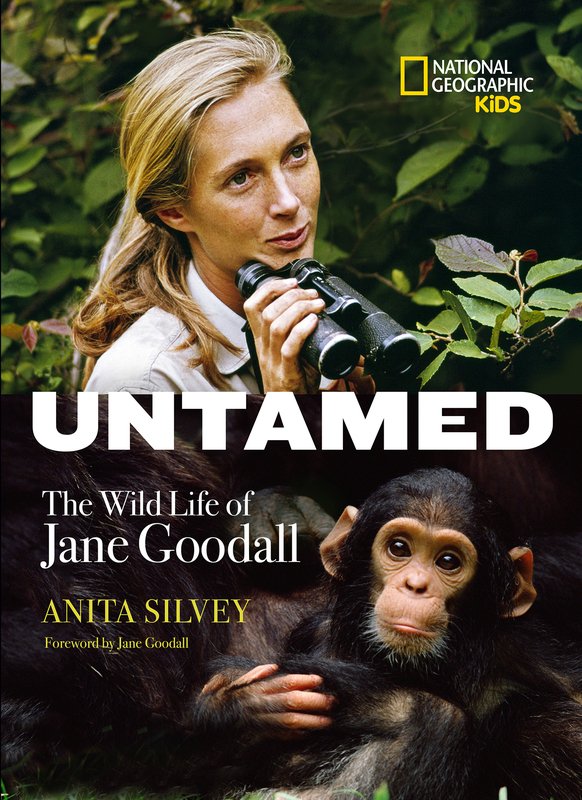 Untamed brings Jane Goodall to life for those who read this biography. Ms. Goodall found ways to succeed where others not only could not, but thought impossible. 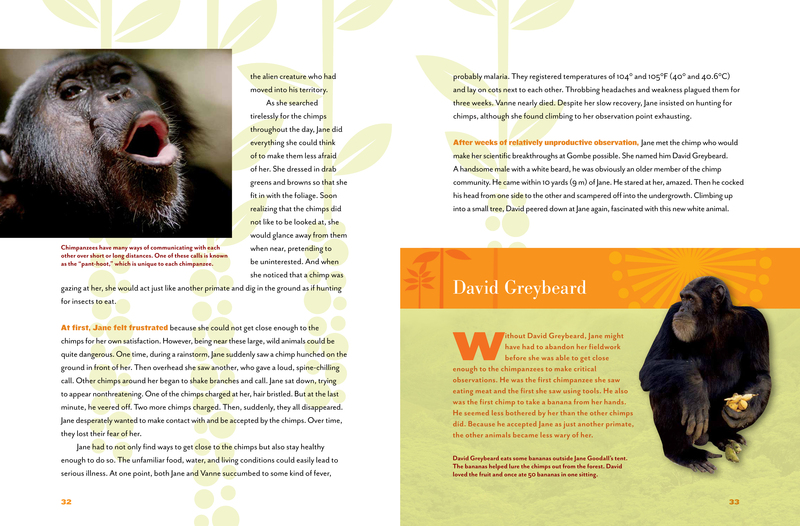 Untamed will inspire others to champion animals and the environment as the two cannot be separated. Kids will love the photographs, many from the research field. Teachers will find many uses for Untamed from science class to simply inspiring girls—and boys—to work hard and aim high. Ms. Goodall’s many organizations—Jane Goodall Institute, TACARE, and Roots & Shoots for kids—will continue her research, improve the lives of the people she came in contact with in Africa, and inspire kids to help their own communities. Her reach is global and all of her efforts will keep conservation and research viable for generations to come. UNTAMED: THE WILD LIFE OF JANE GOODALL. Text copyright © 2015 by Anita Silvey. Compilation copyright © 2015 by National Geographic Society. Reproduced by permission of the publisher, National Geographic Kids, Washington, DC. Purchase Untamed at Amazon —Book Depository—IndieBound Books—National Geographic. Learn more about Untamed HERE. Find National Geographic’s Teacher Resources HERE.
. .National Geographic Kids is an imprint of the National Geographic Society.